Warren Kendall Parker (Pete) age 88, of Holland, passed away peacefully with his family by his side on Monday, December 3, 2018. He was born on February 15, 1930 in Dayton, Ohio. Warren is survived by his wife of 63 years, Patricia (Brunn), daughters, Jill Kempter of Grand Rapids, Jennifer Ernst (Darryl) of Richmond, Virginia, Sarah Schuch of Holland, Gretchen Parker of Oxford, Ohio; four grandchildren, Matthew Schuch, Paul Kempter, Grace Kempter, Eric Schuch. He was preceded in death by his son-in-law, David Schuch. 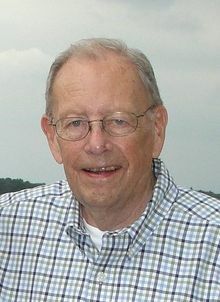 Warren was a member of Grace Episcopal Church, a veteran of the Navy serving during the Korean War and a member of Beta Theta Pi at Miami University, Oxford, OH. As a child, he enjoyed fishing and sailing during family vacations in Northern Michigan. His love for boats continued throughout his life. Warren's kind, generous and fun-loving personality touched many lives; he was truly one of a kind. He enjoyed a challenge and was successful in careers which included hospitality, marketing, sales, accounting and administration. Warren served as president in Rotary International, Walloon Lake Association and Pointe Lake Association. Visitation will be Friday, December 7 from 5-7 p.m. at Langeland-Sterenberg Funeral Home, 315 E. 16th St. Holland. A memorial service will be Saturday, December 8 at 10:00 AM at Grace Episcopal Church, 555 Michigan Ave. Holland with Rev. Jennifer Adams officiating. Interment will be in Pilgrim Home Cemetery. Memorial contributions may be given to Hospice of Holland or Hope for Humanity, Inc. (www.hopeforhumanityinc.org). www.langelandsterenberg.com.